Clarifying the ‘what’ from your personal reality is important as it creates an awareness of: is it me; is it them; is this really worth it? In step 2, take time to explore the facts, not opinions, hearsay or judgements, as they may cloud the reality of the situation. Facts must be based on what was actually seen and heard – by you. Sticking to the facts help limit the possibility of emotion when entering into the conversation as mastering the story makes it objective. By evaluating each, you will be in a better place to remain objective as you have already acknowledged and processed underlying perceptions and feelings. It’s important to consider that humans typically won’t start behaving the ‘appropriate way’ if they don’t enjoy that behaviour due to insecurities, inabilities, social pressures or what they are giving up. Consider how hard it is to quit a ‘bad’ habit. Humans won’t change behaviours until their mind is convinced. Be prepared to help them be convinced. To convince another, identify the bottom-line ‘why’ by considering underlying motivation and abilities. We can easily jump to a conclusion that the why is based on personal challenges, but in reality, there could be some clear systemic or team work challenges. In order to diagnose, the Six Levels of Influence model is a good one to use. The Six Levels of Influence are divided into a) motivational requirements and b) the ability to do what is being asked. We often focus on personal motivation and ability and overlook our social surroundings and structures that support the right behaviours. In order to be influenced to change, we need to be motivated to do so and clearly understand the impact of our choices. When having the conversation, be prepared to help the individual rationalise the impact. Once an agreement that change is necessary, support the other person on how to proceed mentally and physically – what is required? Employees want to be valued and do something of value. Social acceptance is important and pressures can either inspire or deflate efforts. Creating a team environment that consistently lives and breathes the right behaviours is important. Quite often managers avoid holding those accountable who are the root cause of negative behaviours – those that breed an environment of blaming others and politics. 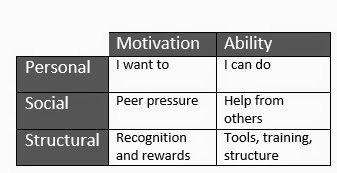 Alignment between rewards and recognition (Motivation) to processes, policies, goals and guiding principles (Ability) are needed to reinforce the right behaviours. Is the structure in place working and is it clearly understood and applied consistently? If not, why?